Another day, another gig. I arrived at The Corporation just in time to catch Aonia. This is a band that is building a significant following and lots of respect from fellow musicians. The band is currently promoting its most recent album entitled ‘The Seven’. I cannot remember how many times I have seen them live but I always enjoy them as they consistently put on a quality performance. Indeed, every member is incredibly strong and talented in their own right. So, what was so different about tonight? In a word Amy Isobel Moore. It was only her second time on stage, her first being at Robin 2 in Bilston just 48 hours earlier. I love Aonia‘s dual soprano singing style but when Amy came up on stage for ‘Come To Me’, she added a whole new dimension that was beautiful and very moving. She then remained on stage for a rousing version of ‘Still We Rise’. Aonia is a band that is very hard to follow. Blaze, of course, was the guy who stepped into Bruce Dickinson’s shoes for Iron Maiden after Bruce left, and with that experience he was always going to put up a fight. Blaze is like the praying mantis of metal: he fixes the audience with his gaze and before they know what has happened they are completely under his control. His band are tight and aggressive, despite Karl Schramm actually being quite ill, he still soldiered on. Blaze immediately had the audience eating out of his hand, he is that good a frontman. He also has a great heart and bucketsful of humility, recognizing that his fans help to make his, and his band’s careers happen. They performed a mix of songs from his solo career as well as Iron Maiden tracks. I personally preferred his new stuff as this to me shows he has truly moved with the times. The highlight of the night came as he was joined on stage by Joanne Kay Robinson from Aonia to perform ‘Together We Can Move The Sun’. Blaze is planning to do a live recording of ‘Spiritual Messiah’, taking performances from 30 shows that he is hoping to organise in the near future. 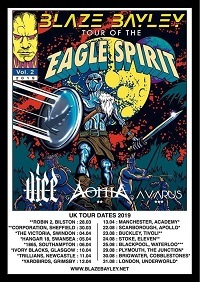 The first leg of the ‘Tour Of The Eagle Spirit’ concludes at the Academy in Manchester tonight (Saturday 13 April). Further dates are planned for late August.